^ a b M. Hamilton, W.R. Hackler (December 2008). "Universal Systems Language: Lessons Learned from Apollo". IEEE Computer. doi:10.1109/MC.2008.541. ^ Dylan, Matthews (May 30, 2015). 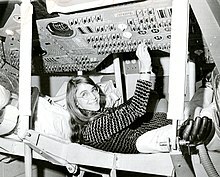 "Meet Margaret Hamilton, the badass '60s programmer who saved the moon landing". http://www.vox.com/2015/5/30/8689481/margaret-hamilton-apollo-software. Vox. ^ Hamilton, Margaret H. (March 1, 1971). “Computer Got Loaded”. Datamation (Cahners Publishing Company). ISSN 0011-6963. ^ Rowena Barrett (1 June 2004). Management, Labour Process and Software Development: Reality Bites. Routledge. p. 42. ISBN 978-1-134-36117-5. http://books.google.com/books?id=JWgAUAqhiv8C&pg=PA42.